One would think nightmares concerning exams and tests stop after school. Nope, they don't, well at least for me, they haven't! Probably once a month, I have a calculus meets language exam dream that will freak me out. I can never remember all the details but from what I do recall, the dream involves me sitting in a classroom, trying to figure out the answers to questions involving limits and integrals in a different language, a language that I doesn't exists. The clock keeps ticking while I try to figure out the answer to the first question on a very long sheet of paper and thankfully during this mental moment of panic, I wake up. Simply put, I think I'm afraid of the unknown, at least that's what I think it means. However, there are times I am also super excited about things I don't know anything about. For example, with dishes where I have no idea what's inside and the kind that might hold a tasty surprise hidden. Stuffed bell peppers bring on that kind of excitement for me! Our farmer's market has a ton of gorgeous types of bell peppers and they appear to be getting much more vibrant and bigger by the week. So this weekend, I goaded M into picking some up for me to overstuff and pan sear and of course, more importantly eat! You can use any type as long as they are large enough to stuff and you have a pan wide enough to fit them in. 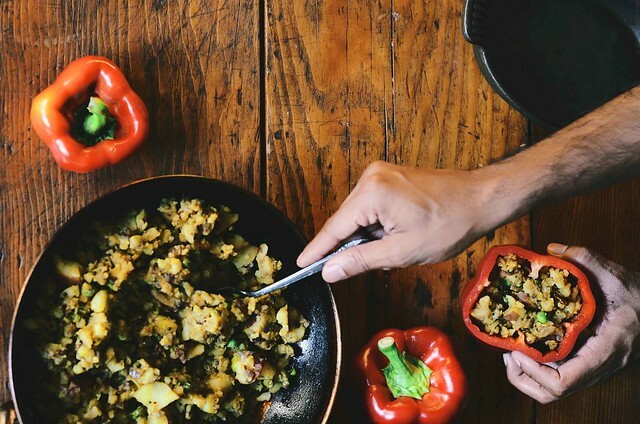 Whenever we ate stuffed bell peppers at home, they would be stuffed them with this spiced pea and potato filling. The filling is simple and easy to make and if you have leftover filling, you can eat it as a side with your main course. 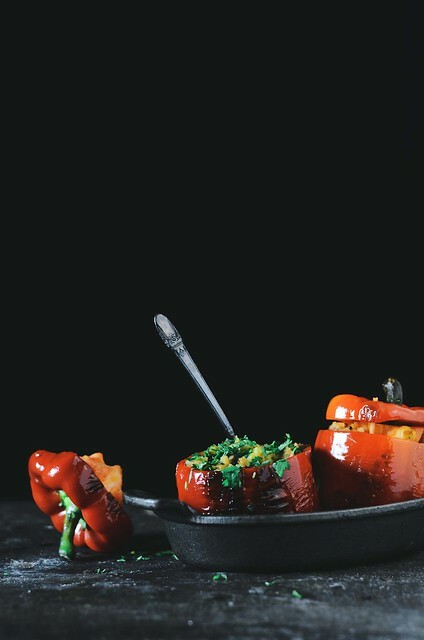 I like to squeeze a little fresh lime juice over the cooked bell peppers, that little hint of sour with the spiced filling and blistered papers makes one tasty parcel of goodness. 1. Cube the potatoes and place them in a bowl of cold tap water. Rinse them to remove any starch under running tap water. 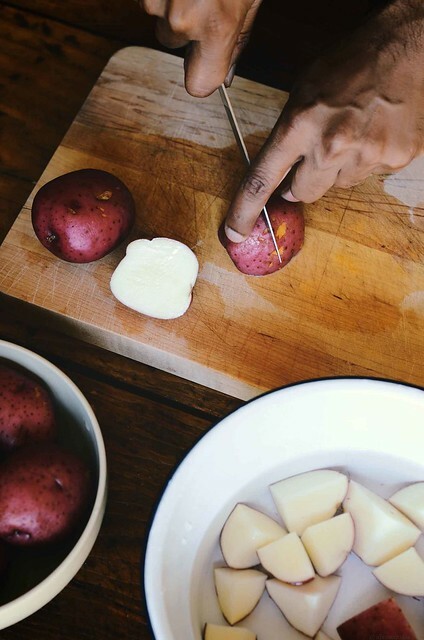 Place the potatoes in a medium-size stockpot, cover with water and bring the water to a boil on medium-high heat. Cook the potatoes until they are just tender but not mushy. (Another alternative to boiling, is to place the potatoes in a microwave safe container and cover with water. Heat on high for 8 minutes until the potatoes are just tender). Drain the water, mash the potatoes lightly with a fork or potato masher and keep the potatoes aside. 2. Heat 1 teaspoon olive oil in a large skillet with a lid on medium-high. As soon as the oil is hot, add the mustard seeds and allow to cook until the seeds begin to sputter. Immediately add the garam masala, chili powder and onion, stir to coat evenly and reduce flame to medium-low, cook until onion is light pink. 3. Add the potatoes, turmeric and salt. Stir to coat evenly and cover the skillet with a lid. Cook for about 10 minutes with occasional stirring. Fold in the peas and then cook for another 5 minutes with a covered lid. Once the peas are cooked, remove from stove and keep the mixture aside. 4. Slice the top of each of the bell peppers about 1/2 inch from the top. 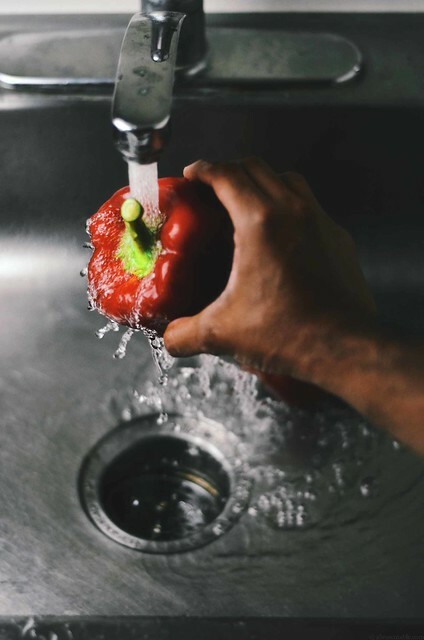 Remove the lid of the bell pepper and remove any seed that are inside. Generously stuff each pepper with the pea and potato filling prepared earlier and cover with the sliced lid. Pass two bamboo skewers through each stuffed bell pepper and cut off any extra length of the skewer. Heat the remaining 1 teaspoon of olive oil in a non-stick skillet with a lid on medium-high flame. 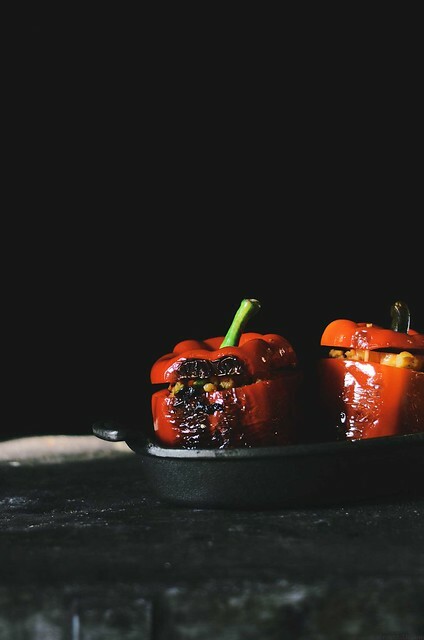 Brush each stuffed bell pepper with the extra oil and place them in the hot skillet. Cover with a lid and cook and rotate each side until the skin of the bell pepper gets slightly blistered. This should take about 1 minute on each side of the pepper. 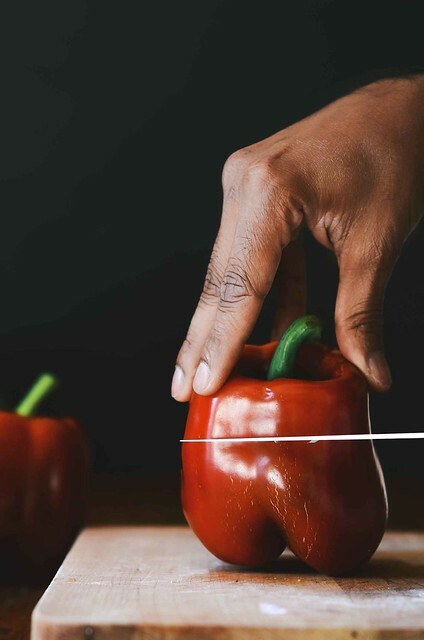 The skewers will help to hold the bell peppers together while they cook. Once the peppers are cooked, remove and discard the skewers. 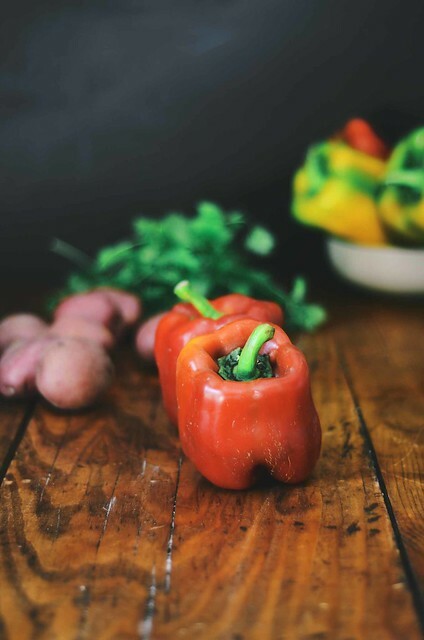 Remove the lid of each bell pepper, garnish with a little fresh cilantro or parsley leaves and squeeze a little fresh lime juice over the stuffing. Place the lid back on top of the pepper leaving it slightly open. Serve warm.